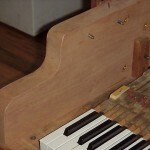 Homestead Piano Tuning & Repair — Click on thumbnail for more pictures! 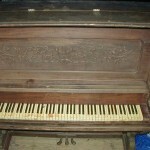 Grand Piano Restoration — Quotes available upon request. 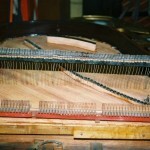 The following pictures show an 1955 Steinway “B” restoration. 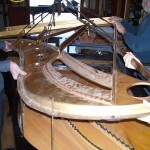 A new soundboard was installed with new bridiges. Complete restringing with new pinblock. Satin ebony case completely refinished with new solid brass casters, pedals and pedal rods. Action completely regulated with New dampers installed. Keybed frame with all new felt and pins and keys with new tops/fronts and bushings. The following pictures show an 1889 George Steck restoration. 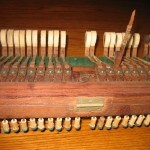 The old soundboard was retained and refinished with new bridiges. Complete restringing with “stepped” pinblock. Satin Mahogany case completely refinished with new solid brass casters, pedals and pedal rods. Action completely rebuilt and regulated with a new set of hammers, shanks and flanges along with a new set of whippens and let off buttons. New dampers installed with underlever assy. being rebuilt. Keybed frame with all new felt and pins and keys with new tops/fronts and bushings. 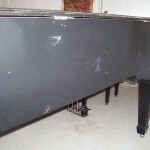 Detailed Upright Piano Refinishing — Quotes available upon request. Complete disassembly of piano cabinet with each piece being “hand-worked” to bring out the full potential of the wood’s beauty. Choose from Satin, Semi-gloss or High gloss clear coats. Custom painting, staining and dyeing available. Service may also include nameboard and pedal felt replacement, New fallboard decal, New Brass or nickle plated hinges and pedals. 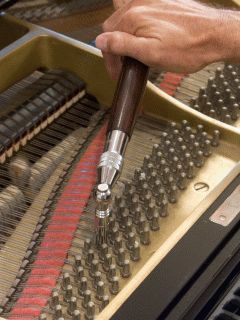 Detailed Grand Piano Refinishing — Quotes available upon request. 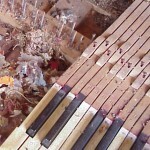 Key recovering increases the value and beauty of old pianos. These one piece plastic molded keytops with fronts are the same as on new pianos, durable and guaranteed for uniform color. Replacement sets with genuine ivory unavailable — However, Ivory two piece tops can be aquired upon request (Limited supply). Select picture to left for pricing information. 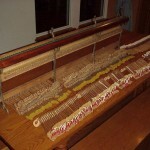 We use premium grade piano wire manufactured in the U.S.A. Drawn to international standards from the worlds finest steel. Exceptional tinsile strength and resistance to elongation. Individual replacement strings as well as sets are available. When applicable, original replacement strings are ordered direct from the manufacturer. Mahogany, Walnut, Black Walnut and other exotic wood Veneers are offered. 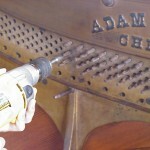 Complete piano re-veneering as well as Small Veneer repairs (e.g. Chips, Scratches, delamintations, etc.) available with expert stain/finish matching skills and foundational wood rebuilding done as needed. 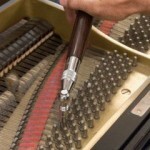 “Missing Parts” replacement on older pianos available with limitations. Complete action rebuilding as well as set replacement (e.g. Hanging new hammers w/shanks, Remove and replace damper felts, bridle straps, hammer-damper-whippen flange sets/center pins etc.) and small individual repairs (e.g. Broken hammer shanks, refelting guide rails, regluing jack flanges, etc.) available.